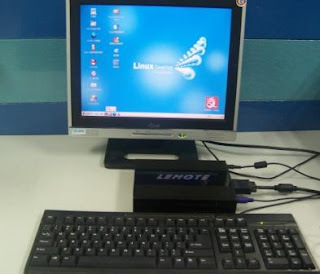 On Dec 8, 2006, Lemote has decided who will be owners of the first 100 Fulong mini-PC. I am one of the lucky users. Fulong Mini-PC is also generally called "Lemote Box" or Loongson Box. "Lemote", meaning "the dream of Loong", is the manufacturer and "Box" is refered to its size, 18 x 14 x 3.7cm. The CPU of Lemote Box is China-made Loongson (originally called "Godson") 2E 666MHz. Although the frequency is low but it actually performs better than PentiumIII. The Loongson CPU is a 64-bit MIPS III RISC processor. Unlike x86 CPUs, it works under only 5-7W power(4.07W in recent test), a small fraction of AMD or Intel products which generally need several dozens of Watts. Main memory and HDD for Lemote Box are those formerly designed for laptops, so the total power consumption is very small. Lemote Boxes may be the best choice for citizens who would like to protect environment of our Earth. The first batch released includes 1000 Lemote Boxes in all, 400 of which for co-operative enterprises and 600 for Loongson fans. All of them are used mainly for a testing purpose. Lemote said that they hope every user who get a Lemote box help in developing Loongson products. Lemote declared that they had started to accept purchase orders for the 1000 miniPC at Nov. 26. Total number of orders runs over several thousands in one week. Lemote is then forced to choose some users from all. Since Loongson is not a x86 CPU, in no way can it support M$ Windows. Software becomes the highest barrier for Loongson's road. Well, Lemote started to accept purchase order at Nov 26 last year and ended ordering a week later. I sent a request containing who me is, how well I can handle Linux and what I would use the Box for to sales@lemote.com. Then they made the decision and sent me a Lemote Box by EMS. It is a little late to get one of the Boxes. You may try your luck to contact Lemote sales.